Ms. Meyers is a credentialed teacher with a master's degree in special education. She spent many years teaching preschool and kindergarten. 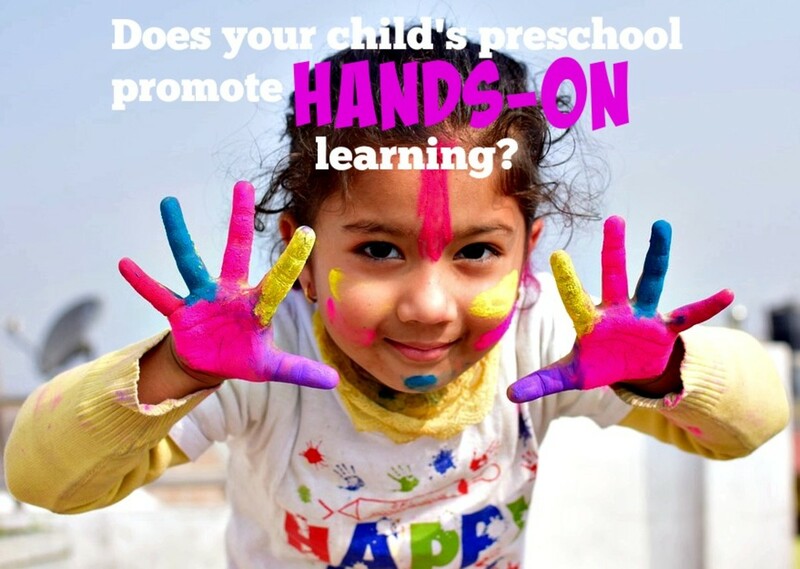 Does Your Child's Preschool Promote or Stifle Creativity? Does your child have an opportunity to paint at the easels each day? Is there a section of the classroom with crayons, markers, colored pencils, and paper where the youngsters can draw whatever they choose? Are there art activities that they do just for pleasure, not because some adult tells them that they must? Does the teacher encourage her students to talk about their art: what it says, how they felt when creating it, and how they went about making it? Do the children feel ownership of their art? Are they proud of it? Does it reflect their ingenuity and originality, not the teacher's? If you're answering "yes" to these questions, pat yourself on the back! You chose for your youngster one of the rare preschools that promotes self-expression and empowerment through art. Unfortunately, most preschools today are obsessed with cutesy craft projects that crush creativity but earn oohs and aahs from misguided parents. What Is a Push-Down Curriculum in Arts Education? In general, a push-down curriculum forces children to learn as much as possible as early as possible so they perform well on standardized tests. In arts education, the push-down curriculum has greatly reduced or even eliminated many of the art activities that were once commonplace in preschool and kindergarten such as painting, drawing, coloring, and creating with clay. Teachers feel pressured to present structured lessons, not provide hands-on experiences. When my son was in preschool, his teacher would introduce a notable artist to her class each month such as Vincent van Gogh, Frida Kahlo, or Henri Matisse. Then she would show the children in a step-by-step manner how to make something that mirrored that master artist's unique style. Parents were enthralled that their kids were being exposed to famous artists at such a young age. They were beyond impressed that their little ones were producing something worthy of being framed and hung in their homes. In their minds, it was something to brag about and they did. 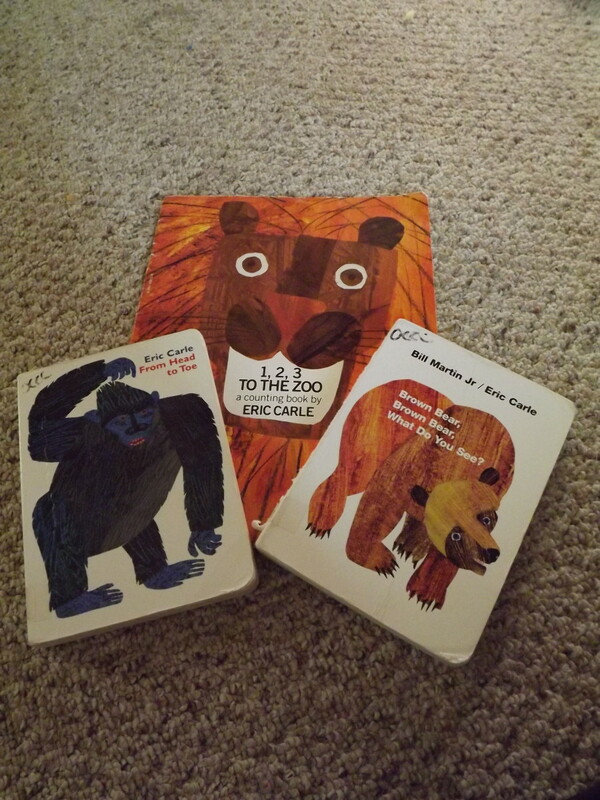 As a former preschool and kindergarten teacher, though, I had my reservations. I knew this was a prime example of a push-down curriculum. I felt sad that our young children's imagination, independence, and initiative were being compromised before they were ever cultivated. For Pete's sake, they were just 4 and 5-year-olds who hadn't even touched on their own unique talents as creative beings and now they were required to imitate someone else. It felt wrong, but it seemed like I was the only one troubled by it. However, it turns out that many experts are concerned about preschool craft projects now dominating our early childhood classrooms. Lisa Murphy, the author of The Ooey Gooey Handbook: Identifying and Creating Child-Centered Environments, worries that youngsters are no longer in control of their artistic vision. Instead, their teachers dictate what they should make and how they should make it. Everyone's project winds up looking the same. Sadly, she says, the finished product is too often considered more important than the process of getting there. In her outstanding book, Murphy details dozens of fun hands-on art activities that kids can do at home and allow them to be in charge. When it comes to preschool art, she says that adults should act as facilitators of the experience, not as instigators. They shouldn't tell young children when, what, or how to create. They should provide the materials, the space, and the opportunities and then stand back, letting the kids have the power. This Funny Video Explains What Preschool Art Should Be! I often hear parents grumble about the push-down curriculum in our schools although they don't use that exact phrase. It frightens me how resigned they are to it, even though they instinctively know it's misguided. I'll hear them lament that what's now taught in kindergarten was once taught in first or second grade. I'll hear them complain that their kindergartners are in the low reading group so they must take them for after-school tutoring. I'll hear them worry that their kids are using iPads, laptops, and computers at preschool and kindergarten, knowing they should be painting, playing, and pretending. I listen as they sadly admit that preschool is now just a training ground for kindergarten with much of the joy, creativity, and spontaneity long gone. This push-down curriculum breaks my heart for our young learners in all subjects but especially in arts education. All children need time to enjoy art as a relaxing pursuit. All children need opportunities to express their unique thoughts, feelings, and experiences through their creations. It's been proven time and time again that art soothes the soul, provides inspiration, promotes mental and emotional well-being, and contributes to a better society. Preschoolers, just beginning their academic journeys, need to see art as a joyful and empowering activity. Yet, at most preschools today, this is no longer happening as open-ended art has been replaced by teacher-directed craft projects. Sadly, most preschool teachers and parents aren't even aware of the difference between the two. What Are Open-Ended Art Activities? Open-ended art activities (coloring, drawing, painting, printmaking, and sculpting with clay) promote a child's imagination, initiative, and independence. They're the opposite of the preschool craft projects we typically see today: the tree made from a youngster's hand print, the alligator made from an egg carton, and a bunny made from cotton balls. While these projects are adorable, they're taught in a robotic step-by-step fashion so they all look the same and promote little creativity. 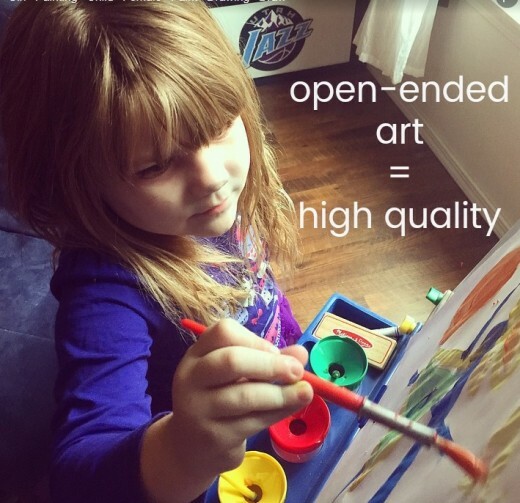 What Is the Purpose of Open-Ended Art in a Preschooler's Life? Open-ended art lets young children express themselves when they don't yet have the words to do so. When they're asked questions about their art, they practice communication skills, expand their vocabularies, and learn to articulate their thoughts, feelings, and ideas. Open-ended art encourages children to take the initiative and be risk-takers, creating something unique that reflects who they are. It challenges kids to be adventurous, exploring new techniques and using diverse materials. The process of making open-ended art is relaxing, stress-free, and promotes mental health. This is especially critical today as we see climbing rates of depression, anxiety, and suicide among children and teens. Open-ended art enhances fine motor skills. Whether they're coloring, painting, or squeezing clay, kids are strengthening the muscles in their fingers and hands. This is helpful when it's time to write, cut with scissors, and tie their shoes. 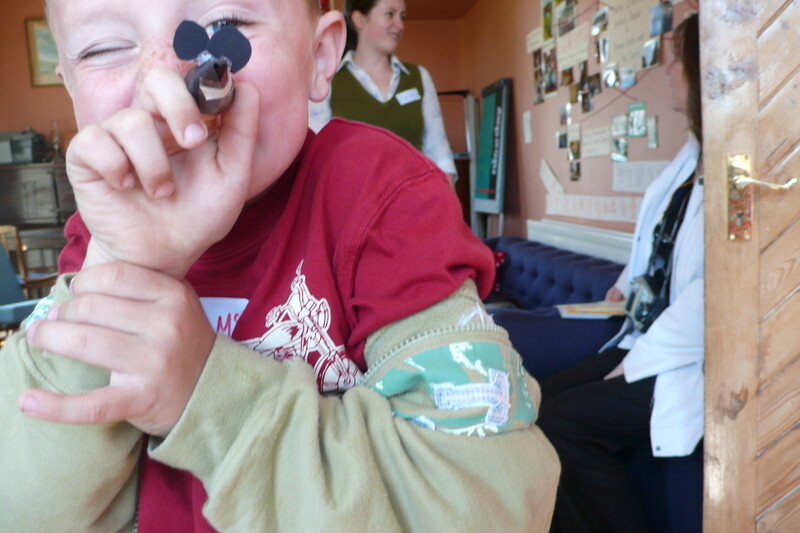 Open-ended art lets children live in the moment, concentrating on what they're creating. Making something is joyful, and the finished product is secondary. The goal is for kids to continue the creative process throughout their lives as a stress reliever, a source of pleasure, and a way to enhance their well-being. Parents should watch this video to appreciate all that's learned through open-ended art. What Are Teacher-Directed Craft Projects? Teacher-directed craft projects have largely replaced open-ended art activities in today's preschool classrooms. Teachers create a sample and then demonstrate to the class how to duplicate it in a step-by step manner. There's little imagination and initiative involved in the process and everyone's project winds up looking the same. 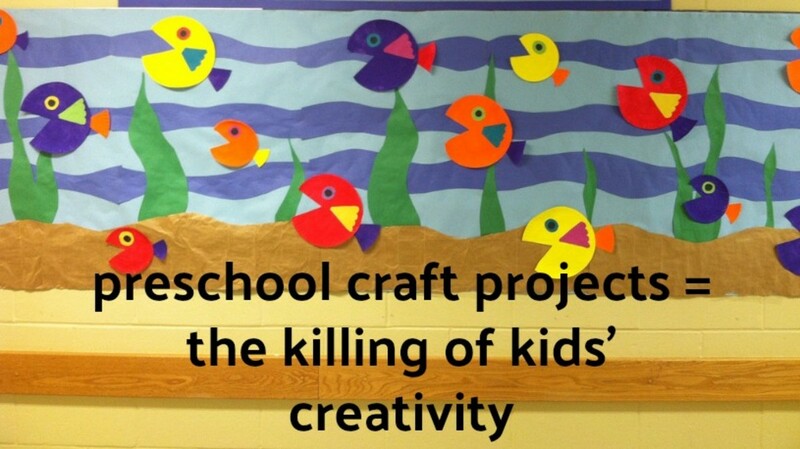 While these projects look impressive on bulletin boards, they don't benefit students. There's no originality involved and the process is robotic, not creative. Why Have Teacher-Directed Craft Projects Replaced Open-Ended Art Activities for Young Children? Preschool teachers need neat and tidy projects for bulletin boards. Parents praise these eye-catching displays to the high heavens, oohing and aahing about how magnificent they look. Teacher-directed craft projects have become a goodwill offering from teachers to parents, leaving children largely out of the equation. Teachers do projects for numerous occasions throughout the year: Grandparent's Day, Halloween, Christmas, Valentine's Day, Groundhog's Day, St. Patrick's Day, Easter, Cinco de Mayo, Mother's Day, Father's Day, and so on. Parents like it because they have decorations to display in their homes and gifts to present to family members. Most preschool teachers have no background in arts education and learn on the job. They get over-the-top craft project ideas on Pinterest but have no overall philosophy about teaching art and why it matters in a young child's life. Some preschool teachers don't understand that kids need to learn about themselves and their bodies first. That's why finger-painting and sculpting with clay are highly suitable. Then they move to learning about their families, pets, and homes and drawing pictures of them. Next, they expand their world by noticing their neighborhoods, schools, and communities. Going on a nature walk and collecting leaves, acorns, and twigs to make a collage is ideal at this time. While teaching about famous artists like Rembrandt and Monet is fantastic for older kids, it's largely meaningless for young ones. That's because they're in what Piaget called the preoperational stage of cognitive development and are very egocentric. What was your favorite open-ended art activity from preschool or kindergarten? Drawing and coloring whatever I wanted. Playing and creating with clay or play-dough. Creating collages with magazines, paper scraps, feathers, and buttons. My daughter's preschool is all teacher-directed craft projects that they put into a portfolio. It shows little originality, and doesn't even look like my daughter's art. How should I address this with the teacher? Sadly, your daughter's preschool is doing what many others do today. They've co-opted art portfolios from elementary schools who've co-opted them from high schools who've co-opted them from art schools. They did this because parents get easily impressed by portfolios, thinking they sound “grown up” and “sophisticated” and will give their child an early edge. Art portfolios, though, aren't developmentally appropriate and have no place during this time when children should be doing open-ended art at preschool. Young children, exploring materials and techniques for the first time, need teachers who recognize that process is far more important than the product. Open-ended art at preschool—drawing, coloring, painting, printmaking, sculpting, and collage making—need to rule supreme while teacher directed craft projects should be minimized or even eliminated. Having high-quality art projects to place in portfolios so parents can ooh and aah at them at the end of the year destroys children's drive to express themselves through art. When considering early education opportunities, parents should look for those that celebrate open-ended art at preschool. There should be easels (inside and outside), crayons, colored pencils, markers, and collage materials that are readily accessible, time throughout the day to create, and play-dough for children to pound, roll, and mold. When I visit preschools for my job, I love to see “creation stations.” These are a corner of the classroom set aside for kids to make sculptures from recycled materials: cardboard boxes, packing peanuts, straws, bottle caps, plastic utensils, etc. This is preschool art at its best as it promotes initiative and imagination. If your daughter's preschool does not emphasize open-ended art, you have a tough battle in front of you. Unfortunately, many preschools today are uptight places that see their primary function as preparing kids for kindergarten. With that narrow mindset, creative expression gets put on the back-burner. I'd suggest you talk to your daughter's teacher and let her know how much you value open-ended art at preschool (this is probably something she rarely hears). Tell her why you see it as important. Ask her how more can be incorporated in the school day. Most preschool teachers have no background in arts education and just pick it up as they go. Your questions and concerns will get her thinking about her philosophy on art education and, hopefully, get her to see the immense value of open-ended art at preschool. Good luck. I admire you for recognizing how important art is for young children. As we see more mental health issues appear in children and teens (depression, anxiety, suicide, narcissism, a lack of empathy), it's important we realize that this increase corresponds to the decline of play and creativity at preschool, kindergarten, and at home. Too many parents see art as frivolous—something that will never lead to a job—but they're way off base! Thanks so much, Venkatachari. I think creativity in art and all areas will make a comeback as we realize what a valuable skill it is for our careers and our overall psychological well-being. I hope young children in India aren't enduring the push-down curriculum like kids are here. It's so sad and the rates of depression and anxiety among youngsters are increasing. When you wrote that your wife had to "fight" for the right for kids of be creative, I could really relate. It's a real battle today to let kids be kids -- playing, pretending, exploring, and creating. A worthy message to all teachers and parents. McKenna, I appreciate your concern for the kids and the killing of their creativity by our educational systems. My wife also used to fight with teachers towards this lack of encouragement and neglect of the children's creative abilities. I totally agree with your reasons and hope that people will realize their folly in due course. Thank you for bringing up this awareness to all. I was a teacher, and I will say this without an ounce of shame...great teachers are worth their weight in gold. They are the ones who give their students the freedom to think and create.